Other worldwide shipping methods e.g. to your home are also available. Shipping costs are based on your location, the method you choose and the value of your order. Please see Shipping Rates & Services for details. This offer is exclusive to Seabourn 2019 Alaska departures and cannot be applied to any other sailing. Valid only if the order is placed within the applicable order by date and “Free! 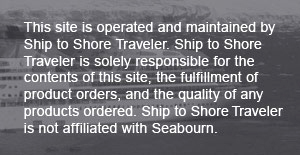 – Onboard Delivery” option is selected upon check out. Applies only to orders placed on this website. This offer may be withdrawn at any time without prior notice.